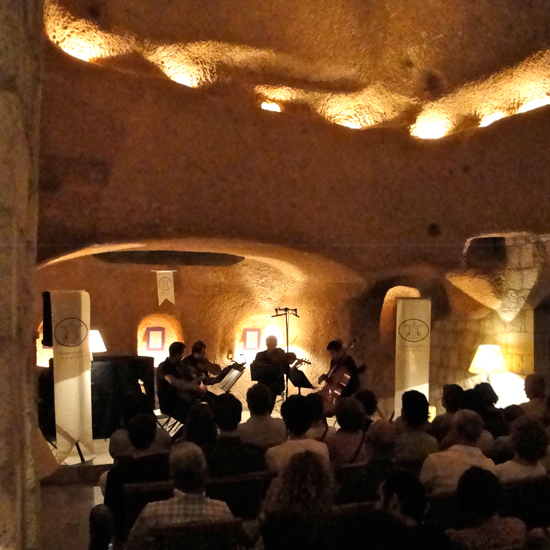 Klasik Keyifler (KK) is an organization dedicated to the innovative presentation of small chamber ensemble concerts and workshops in a wide variety of intimate settings primarily within Turkey. Designed to offer a retreat for artists, a creative portal for music students and a source of inspiration and contemplation for audience members, KK projects seek to close the boundaries between performers and listeners by enabling interaction and by informalizing the concert venues in ways that both reflect the historical origins of chamber music as well as offer a personal immediacy that can be hard to find in large modern concert halls. KK offers workshops for music lovers and designs unique educational programs for young musicians preparing for careers in the 21st century. Cultural exchange and collaboration are central to the KKprojects. For thousands of years the land now known as Turkey has been a major crossroads and the fragments of hundreds of different civilizations are visible side by side.KK aims to connect and bring players from around the globe in order to make music together in these multicultural, historical and “classical” sites thus feeding the imaginations that interpret the musical "classics" of both the East and West. Keyif is a difficult word to translate into English; it describes a process of having reached a state of contentment and euphoria.